Two police officers make a routine traffic stop. They're both experienced officers. Moments later, they're both dead, murdered by an anti-government lunatic named Jerry Kane. This picture of the murdered officers was taken during an large drug bust that occurred before their tragic end. Jerry Kane was driving a white minivan registered to the House of Prayer, a "church" associated with white racist/extremists (TheRaven detests use of "supremacist" to describe pond scum). You can find an audio clip of Jerry interviewed on an Internet call-in show here. This clip is highly recommended, because it reveals much about Kane's state of mind. The first 8 minutes are devoted to Kane raging about two days of incarceration after he failed to produce required documentation for a routine traffic stop. His language is textbook extremism. A comic-book interpretation of law, no understanding of due process and consistent characterization of government, courts and law enforcement as "evil". He refers to the traffic stop as a "nazi checkpoint". The show moves on to Kane's stock and trade - purported advice to beleaguered homeowners. The murdered police officers are Sgt. Brandon Paudert (top picture, left) and Officer Bill Evans (right). They were 39 and 38 years old, respectively. 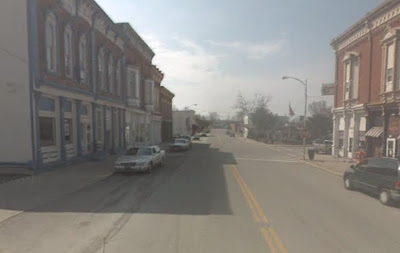 The shootout occurred in West Memphis, Arkansas, on route 40. Kane and his son escaped but were cornered 90 minutes later in a nearby Walmart parking lot. They were both killed in a second shoot-out, in which two more officers were injured, one critically. An "unknown wildlife officer with the Arkansas Game and Fish Commission", who was part of the manhunt, is credited for possibly saving the lives of both injured officers, here. A New York Times article states that Kane has "a long police record" and notes that an expert on financial scams who has testified before Congress believes that Kane was perpetrating financial scams. The two-hour call-in show (which TheRaven listened to in entirety) supports this claim. An official of the Southern Poverty Law Center indicates that Kane's debt-avoidance scams are commonly used by racist/extremists to fund their operations. He also notes recent, sudden growth in the number of known racist/extremist groups. Kane's website can be found here and a series of his lectures begins here. How could Jerry Kane, a white racist/extremist financial scammer with "a long police record", accompanied by a 16-year old boy, murder two experienced police officers during a routine traffic stop? Compared with the officer's side-arms, he had vastly superior fire-power. Jerry Kane had one or more AK-47's. Why are semi-automatic rifles like the AK-47 more lethal than police-issue side arms? 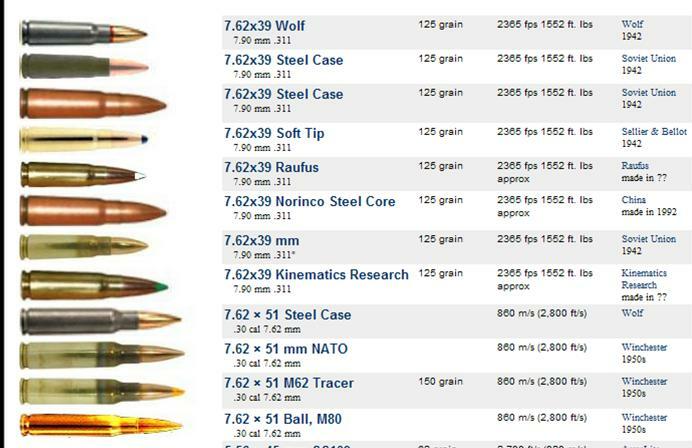 2) Rifle cartridges pack orders-of-magnitude more explosive force than pistol cartridges. How this extra explosive force translates into destructive power is explained further on. 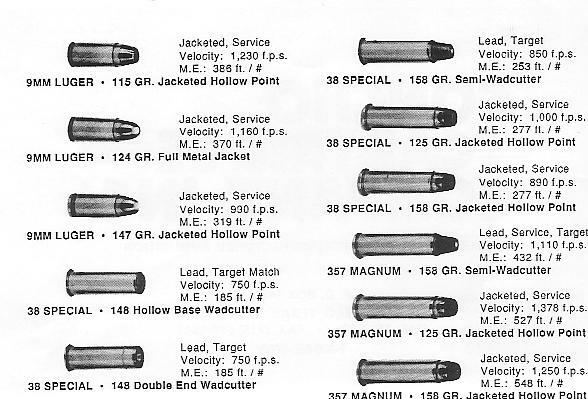 This picture of shows various types of pistol ammunition and one rifle cartridge (right side). 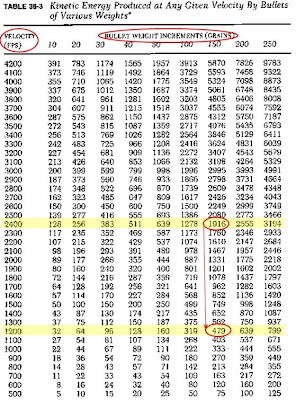 The most common pistol ammo is 9 millimeter (9mm) and one of the most powerful is .357 Magnum. 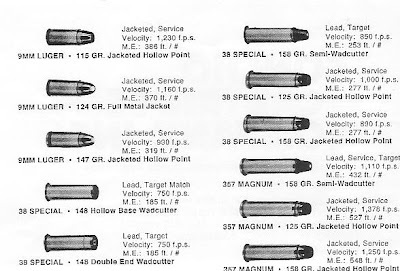 Both designations refer to the weapon's bore, i..e, ".357" means the bore is about one-third of an inch across. Note the size difference between the 9mm and .357 cartridges. 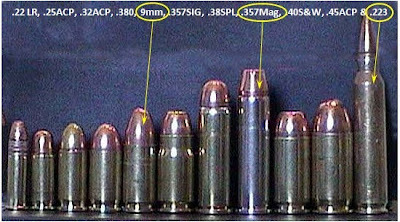 Now compare both to the .223 round on the right. 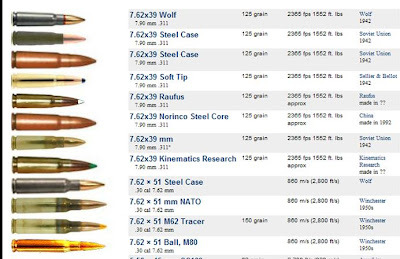 The .223 is similar to ammunition used by the AK-47, which is shown further on. The projectile hurled by the cartridge's explosive charge is the actual "bullet". Bullets are measured by weight, in grains. The 9mm bullet above is a relatively light, 115 grain target round. The destructive power of a firearm is a function of the weight and velocity of its bullets. Bullet velocity is measured in feet-per-second (fps). Note the weights (GR) and velocities (f.p.s.) in this illustration of pistol ammunition. Pistol bullets generally range from 115 up to 200 grains (for .45 caliber) and average roughly 150 grains. 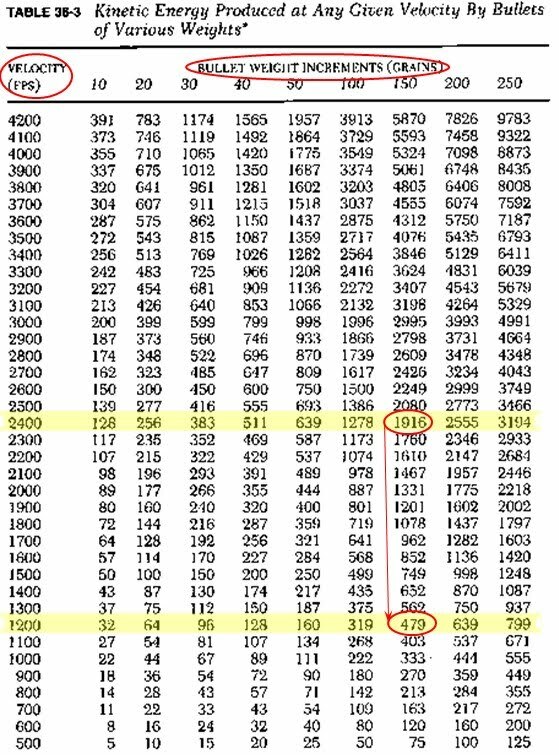 A standard-issue 9mm hollow-point is exactly 147 grains. Pistol bullets generally travel at 900-1,200 feet-per-second. The next illustration provides comparable bullet weight & velocity information for several types of AK-47 ammunition. The illustration was obtained from a web site devoted to the AK-47. The call-in interview with Kane is two hours long. With the exception of one female caller, who reveals her education through vocabulary, it's a tour through the less-advantaged mindset that accords credibility to people like Jerry Kane. His grade-school metaphors, occasional biblical invocations and banal exhortations do not add up to genuine financial advice. Kane repackages well-worn racist/extremist notions of anti-government resistance, for example, urging people to file police reports on recorders of deeds for "identity theft". He makes frequent reference to deeds of trust and power of attorney and refers to money as "FRN" (Federal Reserve Notes). His real message is that individuals win only if they "turn the tables" on their oppressors with false and outrageous claims. He urges several callers to bill banks for their personal time (in one case, a child welfare agency) and divines sinister purpose in double-entry bookkeeping. (TheRaven confesses surprise that racist/extremist rhetoric now encompasses double-entry bookkeeping). His argument for billing personal time is "...a lot of them (banks) will pay it if its just a tiny bit". Kane's limited use of language could only impress a high-school dropout. The AK-47 web site has a top-10 list here. How can one weapon have a top-10 list? Because the AK-47 has been manufactured all over the world. American gun fanciers (the site sponsor is a Tucson gun shop) voted the Polish variant #1, with 1,029 votes, followed by models manufactured in Romania, Bulgaria, Russia and Hungary. It is both a bitter irony and a testament to the congenital ignorance of racist/extremists that they choose to express their notions of freedom with Soviet tools of oppression, which were made available to them through globalization and the triumph of democracy over Stalinism. 1. Anti-gun advocates - all guns are not equal. Stop damning all guns and start picking your shots. Turn the tables on the gun nuts by advocating gun ownership under stringent new, national rules. Reveal the AK-47 as a symbol of anti-American hate and, if you want to help your country, learn some counter-intuitive PR skills. 2. New national rules - TheRaven outlined a seven point national program for legitimate gun ownership in an earlier post. Time to add the 8th requirement: no members of anti-government organizations should be allowed to keep or bear arms, based on the premise of the 2nd amendment. (They can vociferously exercise their 1st amendment rights, we'll keep the guns). 3. Not-for-profits associated with hate groups should be investigated - using a church as cover for racist/extremist activities begs for investigation pursuant to tax-status revocation, back-tax assessment and associated property forfeiture. If RICO plays here, let RICO run. 4. Upgrade police weaponry - New York City police officers carrying assault rifles have became a fairly common sight after 9/11. Highway patrol officers are, on a day-to-day basis, in greater danger. Let officers carry advanced weapons on traffic stops, especially in dangerous areas. TheRaven salutes Sgt. Brandon Paudert and Officer Bill Evans.